well minced, & the rind of 3 lemons grated & their juice add to the whole, well mixed 1/4 pint of brandy & same of sherry. 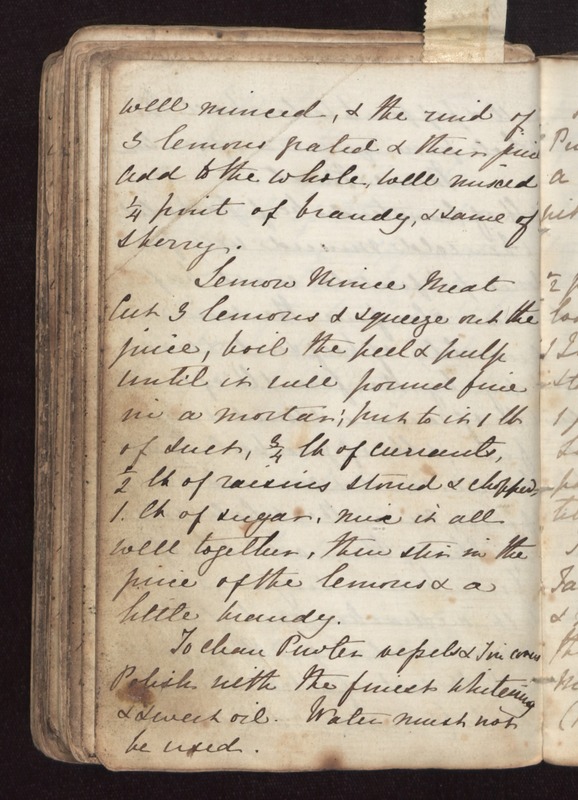 Lemon Mince Meat Cut 3 lemons & squeeze out the juice, boil the peel & pulp until it will pound fine in a mortar; put to it 1 lb of suet, 3/4 lb of currants, 1/2 lb of raisins stoned & chopped, 1 lb of sugar, mix it all well together, then stir in the juice of the lemons & a little brandy. To clean Pewter vessels & Tin covers Polish with the finest whitening & sweet oil. Water must not be used.